This is a Freakonomics Radio extra: our full interview with Shawn Johnson, who’s been appearing in our “Hidden Side of Sports” series. Johnson won a gold medal on the balance beam in the 2008 Olympics, as well as silver medals in the floor, all-round, and team competitions. This interview was conducted by Freakonomics Radio producer Harry Huggins. Johnson was incredibly candid about path to becoming an elite athlete, and her conflicted feelings for the sport that changed her life. You can hear many more of these full interviews from our sports series and elsewhere, by subscribing to Stitcher Premium. You’ll also get early access to our special Freakonomics Radio live episodes, like our game show Tell Me Something I Don’t Know. Just use promo code FREAKONOMICS for one month free. Harry HUGGINS: So first off can you just say your name and what you do. And I don’t know if you started going professionally you by Shawn East or are you still trying to work that out? Shawn JOHNSON: Still trying to work it out, but I think more so Shawn Johnson, professionally. And then Shawn East on the side. And I was a former professional Olympic gymnast now turned, I guess, entrepreneur slash social media influencer. Is that’s the right word? HUGGINS: I think that you don’t come from a particularly athletic family. I’m curious how you got into such an athletic sport. JOHNSON: Well I mean my dad kind of did every sport when he was growing up. He was a hockey player, he wrestled, he did B.M.X., he raced Moto X, motocross, sprint cross. I mean everything. He was kind of this adrenaline junkie. My mom on the other side was kind of stereotypical She was a cheerleader, a little bit. She also kind of did recreational gymnastics but nothing serious. She ran cross-country for I think a week and then that was about it. When I came along, I think I was just this bundle of energy that they had no idea what to do with. And put me in a gymnastics class. A Mommy and Me class when I was two and a half years old. And I just fell in love with it. And just ran with it. HUGGINS: So you started very young. Around six you started training with the coaches that went on to take you to the Olympics. How lucky were you to end up with those coaches? JOHNSON: I was incredibly lucky to end up with my coaches. It was kind of this freak occurrence. I started out at a gym called Urbandale Dance and Gymnastics and it was the only gymnastics place within a 30 mile driving radius of Des Moines, Iowa. And I loved it. It was awesome. But Chow, my coach that took me to the Olympics, opened up a gym about five minutes from my parents’ house when I was about five or six years old. And my parents ended up switching me to his gym because it saved gas money. And it was more affordable for them and the lifestyle that I was choosing. So that was how we ended up there. It was just kind of meant to be. But I was super lucky that way. HUGGINS: I mean that’s one way that you might have been a little lucky was this great coach, this great trainer moving to your town. Do you think there’s a lot of luck involved in being successful as successful as you’ve been? JOHNSON: Oh my gosh. I — yes absolutely. I think a ton of luck is involved. And I feel like that might make it seem like, I don’t know, for successful and elite athletes they’re not as elite as you would think. But I feel like with luck and with elite athletics, it’s just all about falling into the right place and time. It’s kind of this miracle math kind of equation that has to equal the perfect answer. I mean you can’t get hurt. You have to be healthy. You can’t have the flu on the wrong day. You have to find the right coach in the right city. You have to be able to afford it. You have to be the right age. It’s all these random things and when you get all the people who fit that equation, you’re not left with many people. So I guess I was just the best of the very few who fit that equation. HUGGINS: Obviously any athlete who’s achieved what you have in any sport whether it’s gymnastics or football or baseball or hockey or whatever, you have to start taking that activity very seriously very very early on in your life. Can you tell me about that moment when you decided to invest yourself in gymnastics so much from such a young age? JOHNSON: Yeah I think that was a little bit unique in that sense that I was never that child that turned 10 years old and said, “Oh my gosh, I’m going to be an Olympian. I need to give up everything and everyone and just commit my life to the Olympics.” I had this unique story of blue collar family, all American, Midwest just kind of parents that wanted me to be normal. And they pushed me to be in so many sports and so many activities and tried the oboe and clarinet and piano practice and mock trial and all these things that kind of distracted me from this Olympic dream that I had. HUGGINS: Yeah, only two years after that you were there. JOHNSON: I know. That’s so weird to think. I’m 26 years old now and feel I could never do the Olympics. Let alone being a 16 year old baby. But when I was 14 I made the national team and started traveling the world. And I think that was the first time I thought to myself maybe I could do this thing. HUGGINS: I mean that’s abnormal, right? Most gymnasts, from what I’ve heard, they make that decision from a very early age and are put into those walled off training camps where they don’t get in touch with the outside world, they have private tutors and stuff. And you actually went to high school full time when you were training and you kept, as you said, at least a partially regular childhood. Do you think that level of intensity is kind of necessary in some sports but not others? And why do you think you were able to do without it? JOHNSON: Wow, great question. So I had this interesting set up with my coach. My coach was Chinese, born and raised Chinese. When he was three years old, living in China, he was taken away from his family and actually put into their Olympic system. And raised to be an Olympic gymnast in China. And he kind of had this career within the gymnastics world in China that I would say almost traumatized him. He lost his childhood. He kind of lost his family in this trend. This crazy career. So when he was 21 years old he actually left China, came to the United States, opened a gym in West Des Moines, Iowa, of all places. And had this dream, this American dream, to raise an Olympian or Olympians that were also children and how to balance in life and were fun loving and had a true childhood. And I was really really blessed to fall under his guidance and his coaching because he let me go to school. I mean not even let me. He kind of demanded that we go to a full day of school. He encouraged us to go to school dances, to go to Dairy Queen after practice. He incentivized us by letting us sleep over at the gym and have popcorn and ice cream. And he just was this fun loving guy. And I think because he let us have fun as children, but yet pushed us and challenged us at the same time, it challenged us and encouraged us to go farther in the sport. And I feel the intensity of elite athletics, you weed out a lot of people just because you burn them out so quickly. So no, I don’t think the intensity is necessary. I think you need intense training but in small doses, not the 80 hours a week people think. HUGGINS: Right. And you still did make the decision to go all for it at age 14, which is pretty young. Do you think that having made that decision that young makes you a little bit different than other people your age? JOHNSON: A little bit, I would say. Deciding at 14 years old that I was going to devote my teenage childhood to the Olympic Games kind of gave up that area of my life, of anyone’s life as a teenager, adolescent, of dreaming of the things that they would become later on. I mean, for me, choosing to be an Olympian was choosing to be an Olympian for one moment at the 2008 Olympics, for that short period of time. After that I’d have to start over. So I think it makes me a little bit different because as soon as the Olympics were over, I kind of was set back in a way. Because I had already completed that future goal. And I had to figure out what was next. HUGGINS: The other thing that brings up, and then we’ll move on from your early years, but another thing that brings up to me is that, when you do make that decision, and especially with people who make — who go into gymnastics full throttle earlier than you did, I mean you’re a kid and you’re basically putting your life in the hands of adults who aren’t your parents, the coaches and the trainers and stuff from a very young age. Did it feel like —I think there is — did you ever feel that kind of vulnerability as a young athlete? JOHNSON: Yes and no. I mean I was a very, very fortunate child within the gymnastics community to have very loving very, very protective people around me. My coach had very very strict rules when it came to anybody kind of being — I don’t know another opinion or another coach or another professional figure in my professional career. Whether it was a trainer or another coach or even the United States coach. I mean everything had to be okayed by him. He was kind of my protector. And I think there was a vulnerability there because I trusted him so much but I only trusted him so much because my parents trusted him. And he I mean given today’s society I can thankfully and say that he kept me safe and I am forever grateful for that. HUGGINS: Going back into your career, before you even go to Beijing you got a lot of attention. I remember you were in ads for Coca-Cola and McDonald’s and this is all before you even competed on the — this is all before the Olympics. I think I saw you were inducted into the Iowa Hall of Pride and they had a butter statue of you at the State Fair which is amazing. HUGGINS: And so you’re married to another athlete. A long snapper in the N.F.L., and I’m just curious how your experience with that level of attention compares to his, being that his sport is in the public eye much more regularly, but not with the same intensity as yours is. JOHNSON: Wow. Yeah, I think it’s completely different. I love that I did marry an athlete because I don’t feel like it would have worked out any other way. We’re so competitive by nature with everything it just —it balances each other out to compete against each other. But with gymnastics and with that celebrity status that crazy, the thing that happens right after the Olympics. I think with the Olympics and especially gymnastics you have this 16 year old child on the screen that you’re watching on NBC for one hour a night for four weeks. And you kind of see this icon of an athlete. You don’t get to know them, you don’t get to know their sport. You only see them once every four years. And I think it puts you on this pedestal as a celebrity athlete where you do get butter statues and stuff, those weird things right after. But it’s kind of a commodity that kind of comes and goes. And I think the difference between gymnastics or Olympic sports and something like the N.F.L. is no — You know, my husband might not be one of those huge names that sticks out amongst every N.F.L. player within the N.F.L. industry, but yet he’s a part of an industry that the entire world knows. And they watch every Monday or Sunday night or watch during preseason or watch training during offseason. I mean it’s something the world is committed to. Whereas the Olympics isn’t. So I think in a way he’s a lot bigger of a celebrity than I am just because people are such avid fans of the N.F.L. HUGGINS: But you did get that kind of superstar treatment during the Olympics when you were there. Did you feel like the sport of gymnastics gets a superstar treatment in general at the Olympics? I mean did you feel singled out or anything? Or were you too focused on everything going on at the time? JOHNSON: I was pretty focused on everything going on but I would say yes, the gymnasts and kind of gymnastics as a sport or a sport at the Olympic Games is a very popular sport. I feel like when you walk around the Olympic Village when you’re doing interviews, when you get those media requests, when endorsements come in and sponsorships and all of these opportunities, I think gymnastics along with track and field and swimming are kind of the top three. So yeah I mean in a weird way of saying that I did feel pretty I guess superstar-ish. HUGGINS: But then for the rest of the season going up to the Olympics and when you’re trying to qualify again after that, what is gymnastics like? Because I know a lot of people don’t really follow it then sadly. But what is it like then? What’s the regular season like in gymnastics? For our non gymnastic-head listeners. JOHNSON: Gymnastics during the off season with celebrity status I would say, or media coverage, I mean, you kind of fall off the face of the Earth. Nobody cares. Gymnastics is one of those sports where people care a lot about it during the Olympics once every four years. But then outside of that it’s kind of like “Well, what is gymnastics?” They don’t care. Which is weird during the offseason because that’s when the blood, the sweat, the tears, the dedication you’ve put in your entire life and the real purpose of your sport. That’s kind of where it lies. HUGGINS: Can you run through what the regular offseason or the regular non-Olympic season looks like? Because I just think people are so unfamiliar what — Like all of the other events that are happening throughout a year, throughout the three years. JOHNSON: Yeah an off season year for kind of an elite level or an Olympic level gymnast is — I mean you never get a day off. You get every Sunday off of the year but that’s about it. No holidays, no birthdays. It’s all year round. And you compete probably ten times a year and you’re competing at these World Championships and kind of international events all over the world against the same girls that you would see at the Olympics but you compete in the off season or kind of off Olympic season to kind of build your name and build your status and build that — I don’t know, reputability with judges and international competitors, that kind of build you up for the Olympics. HUGGINS: So then going to the Olympics in Beijing, you were the only gymnast I read this, so tell me if it’s not true. But you were the only gymnast to compete in every event every day. Is that true? HUGGINS: Is that for the U.S. or for just — do you remember if that was just for the U.S. girls or for all of the gymnasts in all of the countries? JOHNSON: It was just the U.S. girls. HUGGINS: So you were the only U.S. girl — the only U.S. gymnast — to compete in every event every day. And you’re performing obviously to the max of your ability under the max amount of pressure. Can you walk us through what you’re thinking about and what you’re focusing on and how you’re dealing with that pressure in the middle of a routine? JOHNSON: Oh my goodness. Let’s go through a lifetime’s worth of sports psychology here. JOHNSON: Yeah. So being 16 years old, I think a true advantage to being a younger Olympic or elite level athlete is you really don’t have the brain space to calculate all of the distractions. As a 16 year old, you’re not thinking about all of the what ifs and the people in the stands and paying the bills at home and your kids or whatever it may be. You’re kind of just that 16 year old that’s obsessed with whatever you’re obsessed with. So for me, I was lucky that I was this 16 year old teenager that was obsessed with gymnastics. And the sports psychology side of it, I mean going into an event like that with you know 15,000 people in the arena and millions of people watching live on NBC or whatever it may be, for me it was just this game that I would play with myself. I would tune out the entire world, kind of reimagine the arena I was in as if it were my home gym, and take it one routine at a time. I mean I truly — in a very odd way, I don’t know how to even say that. I would try to convince myself I wasn’t at the Olympics and I would try to convince myself that it was no big deal. And go numb almost. HUGGINS: Yeah. So I heard that you were trained to think of a different key word to focus on during your routines, during every second routine. And I’m curious what that actually means. What are some examples of those key words? JOHNSON: For example, if I were to teach you a standing backflip. Okay, just a regular backflip, I would probably tell you to lift your shoulders or kick your feet or keep your chest up or whatever it may be. So these keywords we choreograph a routine that you guys see visually. It’s the physical routine that we are competing on the balance beam or the floor or the bars. It’s the flips, the tricks what you witness. But we also choreograph a mental routine. And it’s this kind of sport psychology trick, I would say, where the second we start this routine, if I’m thinking of something every second of that routine that’s choreographed, that’s part of this practice, that doesn’t allow me to think of anything else. If that makes sense. So if I can keep my brain occupied for 90 seconds of routine, which is the full routine that means I don’t allow myself to kind of wander my brain and allow myself to think of like, oh I might fall off or whoa that’s a bright colored shirt someone’s wearing in the audience or whatever it might be. JOHNSON: Yeah. Actually, you’re not too far off with some things. I did most of my skills like — if I jumped up on the beach my very first skill was say a back handspring, back layout, I would think, tight. Raise your arms. Kick your legs. Stay square with your hips. Finish with your feet together, or whatever that might be. But then I distinctly remember, I had this skill in my Olympic beam routine. It was a standing backflip with a full twist, so like a 360, 360. But it was on the beam and I don’t know why, but I would always think to myself whatever stays in motion — or whatever is in motion stays in motion, unless acted upon by an outside force. You know, law of physics. But I would say it to myself every time I did this routine and I did this skill and it was my way of saying, essentially, unless I act upon the momentum that I’m — I was such a nerd. Oh my gosh. Unless I act upon the momentum that I’m propelling my body into, I’m going to fall off the beam. So I was a nerd. Yeah I’d think of things like that. Or hamburger. JOHNSON: Oh absolutely. I think we become masters of that. Because gymnastics is terrifying. I mean now that I’m 26 and I have been practicing these psychology tips and tricks, I am terrified of gymnastics. I would never get up on balance beam right now and try to flip. I would hurt myself. But when I was competing, I mean I always said, my coach always said it as well. I feel like anybody in the world can be trained physically for an Olympic event. It’s just a matter of how the body works. You can train your body to do it. Now training your mind is the hardest part because learning to overcome fear, learning to push aside thoughts that are negative, learning to calculate the risks involved, and still take that risk of injury or of failure or of falling on your face in front of the entire world is really difficult to kind of — to do. And especially as a kid you think of the repercussions involved. But I think you become so good at telling yourself it’s just not going to happen that you start believing all of the positivity and you believe that things will turn out properly. So your body kind of does it for you. HUGGINS: Well that’s why I find gymnastics and figure skating so interesting, but especially gymnastics is, you’re not really competing against anyone other than yourself. And even with that, you’re setting your own standards that the judges are going to judge you against. So I’m curious how much risk assessment and evaluation there is when you guys are picking your routines beforehand. Correct me if I’m wrong, but you submit to the judges what your routine is going to be for any particular routine. And then you have to perform it. But beforehand you could say, “You know what, I’m going to set my routine to be something I could nail a hundred percent. I’m not going to have that much risk involved and I’m going to do it. ‘How much of that risk assessment are you guys doing beforehand? JOHNSON: Well first, I’m very impressed how much you know about this because that’s — I’ve never heard someone understand that. So props to you. HUGGINS: I’m telling you, I love gymnastics, it’s great. JOHNSON: I love it. So when you’re competing at the Olympics or any international competition, you do submit your routines before you compete them. So it’s usually the day before. You’re warming up, you’re in competition, you’re doing these routines, and the judges get to get a look at what you’re going to be doing. And you formally submit a form that says this is the routine I will be competing tomorrow during the medal round. Now the calculated risk you’re talking about is —I mean our entire sport. I feel that’s what makes or breaks a medal round in an athlete is calculating, do I go for the more difficult skills to get a higher score or do I go for the safer skills where I know I’m going to hit them perfectly and I’m not going to get any execution deducted. And for me, I was an athlete that took a lot of risk. But I put a lot of effort behind the scenes in those risks that I was taking to kind of give it a balance of, I am doing the harder skills to get the higher score. But I also have the confidence behind them to not lose any execution. I would say people would agree when I say I was more of a risk taker than other people. I pushed the boundaries of our sport and our difficulty and our skills. I was doing skills that normally just men do Which was interesting for the women’s artistic gymnastics world to see. But I loved it. I was confident with it and because gymnastics is a sport judged on biased opinion, judges are literally allowed to score you based on their impression of what you’re doing. It’s subjective. I felt most confident being risky and I think it rewarded me that way. HUGGINS: So does the subjectivity in the judging, does that ever factor into how you react to — does it make losing a little bit easier? JOHNSON: Yes and no. So we kind of train ourselves as athletes knowing that the judges are subjective. Almost an extreme extent to where if I were to be competing at the Olympics and I fell or I made a mistake in my routine, I am trained, by my coaches, by myself, to not show any emotion. Because it goes into that kind of psychology idea that if I look upset and the judge sees that, she must then interpret that there must be something wrong and she might say oh I didn’t see anything wrong but she looks upset so I might take something from it. Does that make sense? So when we’re training, it’s all about your demeanor. It’s about how you’re presenting yourself. It’s about even when you make mistakes you have to fake it and make it look like it was actually intentional. So it’s just this whole kind of facade you put on. And even when you lose, I guess it’s not any easier because you practice the facade so much that you kind of feel like your facade wasn’t good enough. HUGGINS: So speaking of losing, I was heartbroken by this too. You came so close in the all around in 2008. And it’s not like you did anything wrong but it was just that you were the casualty of an otherworldly performance by Nastia Liukin. Do you think that you — I know you guys are friends, I know you won’t say anything bad about her. JOHNSON: Yes. Best friends. Best friends. But man she could have just not had her best day that day and it would’ve been good with me. JOHNSON: It was for the United States. HUGGINS: Yeah. Do you think that gymnasts learn to deal with losing differently than other athletes because of how individual the sport is? JOHNSON: Oh my goodness. No. I feel if you are an elite athlete losing per se never gets easier. I don’t care if it’s a team sport or an individualized sport. I almost feel because it is an individualized sport it’s almost harder to lose because there’s nothing to blame it on but yourself. You can’t blame your teammate or your competitor for having a great day. You can only blame yourself for not having a better day than them. So I feel as gymnasts, we almost probably take it harder than anyone else because it’s all on us. HUGGINS: Wow, that’s super interesting to hear. So I wanna go to the gold medal routine on the beam. What do you remember of that routine? Because I’ve seen in interviews that you’re giving before that you actually blacked out during it. HUGGINS: Is the amount that you remember for that gold medal routine more or less than you would remember of your other routines? Especially in the team and the all around ones, the earlier routines? JOHNSON: Oh, it’s so much less. I remember everything about my floor exercise medal round, my all around medal round, the team competition in the Olympics. All of it. But I just don’t remember the beam. And I think it’s funny because, going into that day, like you said earlier, I had been competing for months on end without any break. And I was exhausted. I was ready to go home. I was ready to be a 16 year old kid where I ate hamburgers and laid on the couch and just relaxed. I didn’t want to be an elite level athlete anymore. And I woke up that day during the medal round for the beam, which was the very last day of the Olympics, and I was tired. I was exhausted, mentally drained. I actually had the flu and it was just the worst day ever. And I went into practicing getting ready for that big performance and everything was off. I kept falling. I kept making mistakes that were just uncharacteristic of me. I just was not myself. And I remember just beating myself to death trying to get myself snapped out of it. I would do routine after routine after routine warming up in the back, just trying to get my — kind of that motor memory to kick in. And it just wasn’t working. So I went running out onto the competition field when it was my turn. I’m white in the face. I can barely breathe. I’m just exhausted. I still feel like I’m going to throw up because I have the flu. I remember saluting to the judges and getting ready to start that mental routine of what stays in motion or whatever. And I just blacked out. My body took over, my mind shut off, and all I remember was finishing my dismount. And it was the weirdest experience of my life because I felt like I truly just wasn’t there. It was an out of body experience, but it was pretty cool because I looked at the scoreboard afterwards and I had won which was kind of crazy. HUGGINS: I mean you must have watched the video since then too of your performance. Did that jog your memory or anything, bring back anything? JOHNSON: Yes and no. I do remember finishing my beam routine and thinking to myself, that wasn’t my best performance. And that being the extent of my thoughts. Usually after a beam routine, I could break it down for you and say, this scale was a little off in this way because of this. You know, my technical execution of this skill was a little off because of this. I mean I could go through every detail. And with my Olympic medal round beam routine, I knew it wasn’t my best. But I didn’t know why. And so when I went back and watch the videos I was like, “Oh that’s why I wobbled on this and this was a little off.” But my memory and my brain just went black. HUGGINS: I mean that’s like Michael Jordanhad his whole flu-game everyone talks about as making him the best of all time too so. It’s probably a good sign to have a good day when you have the flu. HUGGINS: Do you think you could do any of it today? HUGGINS: Like not right now. I mean like — obviously. But do you think you still have it in you to do any part of that routine still? JOHNSON: I have actually wondered if I could do it again. I mean the training, all of it. And I’ve actually had thoughts of trying to do it again. JOHNSON: But — Yeah, I’m definitely not going to, But every once in awhile — I mean I love gymnastics with every ounce of my soul, so every single day is kind of that day where I’m like, “Ah man I wish I could do it again. Why not try?” But I do think that my brain, my body, everything as a teenager and an adolescent is different than me as an adult. Do I believe that I still have the capabilities and ability to like to channel that kind of monster, beast, whatever I created back then? Yes. But I think it would just be different. I calculate things differently. I don’t have that naive brain anymore, and I think that would hurt my gymnastics performance. HUGGINS: So this is a kind of a theme that we are trying to bring up a lot in the series that we’re — the sport series that this is going to be for. But I’m curious where you fall on it. So do you think that ability in you to kind of just hone in on, to focus on, to focus that hard on anything, do you think that is something not necessarily genetic, that you were born with, or is something that’s unique to you, or do you think it’s something that anyone can learn or a lot of people can learn? JOHNSON: Interesting. I think this contradicts my last answer. I would say it’s definitely just born. I mean you’re born with it. At least part of it. Only because I, ever since the Olympics, I’ve gone into coaching, I’ve been able to work with some of the best athletes in the world in gymnastics. And little kids in gymnastics of all age ranges and talent and abilities. And I have seen some of the most physically gifted and talented gymnasts I think our sport has ever seen. But they just do not have the mental capability to get themselves to that elite level. And it’s not a matter of training them or getting them to the right sports psychologist or getting the right people around them. It’s just it’s not there. So I would say I think you have to be born with some sort of innate ability to push out all pain and emotion and push yourself to — past a boundary that 99 percent of the world kind of operates within. HUGGINS: When you say that they just — it’s just not there, or they just don’t have it. Can you talk a little bit more about what it is like that’s missing there, specifically. You don’t have to give any names, obviously that’d be mean, but what does it look like when a gymnast — What keeps a gymnast from reaching that Olympic level? JOHNSON: I would say as a coach a lot of the traits that you see is — you might have a girl who has the perfect body type. I mean she’s flexible, she’s powerful, she can flip, she can twist, she can do everything. She’s coachable. But yet doesn’t have the drive, doesn’t have the internal — I don’t know, just voice that’s pushing her to go farther. As a coach you can only push an athlete so much with words and with cues and with training. But an athlete has to have some drive in them that pushes them that extra yard, that puts them on an Olympic podium. And if they just don’t have that passion within them, I mean you can’t fake that. HUGGINS: So switching gears a little bit. What then makes a great gymnast? And by that I mean what combination of natural physical traits or personality traits or —and — I mean you can bring in luck in here or whatever. 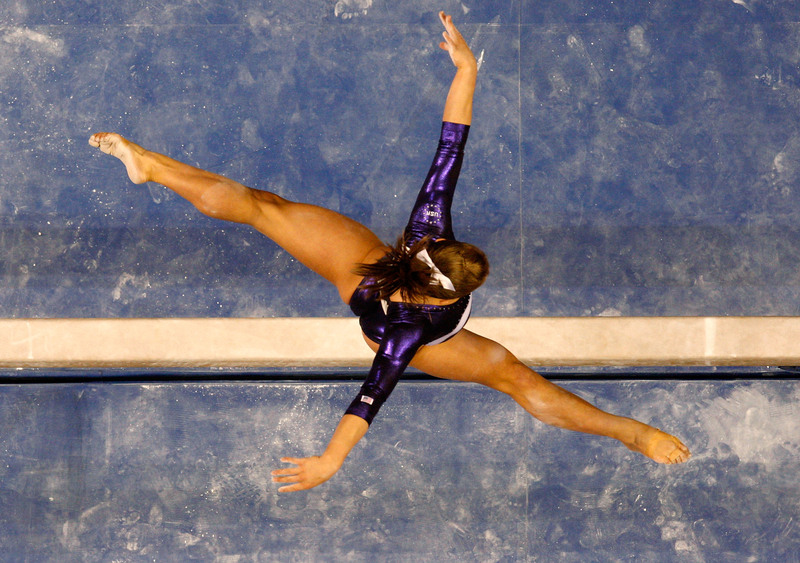 But what makes someone great in gymnastics? JOHNSON: What makes a great gymnast. I would say if you are looking for an Olympic gold medal gymnast, you need confidence, obviously. I mean talking about the subjectiveness of our sport. If you aren’t exuding confidence, you aren’t wishing and willing these judges to give you a score. You have to be able to kind of push your emotions onto a judge. You need power. You need flexibility and grace. You need a lot of luck. Gymnastics is a very, very dangerous sport and one that forces a child to become an adult in a very adult level playing field I guess. And I feel like as a child, just your ability to burn out or to get injured, it just goes up from there. And luck plays a huge part in that. HUGGINS: No offense to your husband, or anything. JOHNSON: No, not at all. I mean if you watch the Olympics, you have a 16 year old competing for your country, wearing your country’s colors, and your flag and everything. And you’re sitting at home screaming at this child, like saying, come on win our gold medal. Bring it home and you’re putting a pressure on what you assume is an adult but is actually this adolescent teenager who has no idea what it is they’re doing. And I think it’s just interesting because the training that goes behind that, you have to strip a 16 year old of all the emotion, of all child-like features. And make sure they understand the magnitude of the situation, so that they don’t let down those people at home sitting on the couch. HUGGINS: Do you think that kind of pressure makes, not just gymnasts, but other athletes your age more mature than other normal 26 year olds? Or any other way different than normal people who aren’t athletes? JOHNSON: I would say unfortunately, yes. And I say unfortunately because as a 16 year old kid, I think you should be allowed to be a 16 year old kid. And I know asking for that on top of being able to be an Olympic level athlete or Olympic caliber athlete is asking for like my cake and icing eating it at all too. So I know that’s probably not possible, but I think you do sacrifice with these children a child-like emotion and part of them that they will never get back because you’re forcing them to become an adult, to live on their own, to not show emotion, to take on the pressures and the weight of your country and your world on the world’s biggest stage. And that’s a lot. That’s a lot for anybody to handle any age, let alone a child. HUGGINS: Yeah. Thanks for —that was kind of a tangent that I wanted to go on, but thanks for following me down it. HUGGINS: I want to go back to the sport itself and you mentioned how you were a lot more athletic than previous gymnasts and other gymnasts had been, especially a woman gymnast. And that’s kind of a trend that it’s been continuing even past you. But I think you may have started or other people have started before you. But how much has the sport changed recently with extremely athletic gymnasts like you and Simone Biles becoming more common. I mean, I don’t want to make you question your friend, but do you think Nastia Liukin would be able to win today? In four years, do you think it’s going — the sport’s going to be totally different than what it was like 10 years ago? JOHNSON: I think our sport is ever changing. And there’s actually this kind of law rule in play where every four years the head figures at play, whoever they are, the people who make the rules. They’re allowed to take the rulebook and essentially throw it in the trash and start over. And based on their rules and what they write every four years that’s how these gymnasts train for the next Olympics. That’s how they train their bodies. That’s how they’re training them to look like, to perform, everything. And for example in 2008 our new rulebook favored Nastia’s style. It definitely favored the long flexibility and grace and leaps and the more Nastia-like skills. Whereas it didn’t favor my type of skills. The more powerful, stocky, men-like —it sounds so attractive gymnastics. Whereas, fast forward four years from 2008, our rulebook was thrown out. It was rewritten and it favored my style of gymnastics. Now put both both Nastia and I in the 2012 Olympics, I don’t know if either of us could have kept up. I mean the level of skills they were throwing in 2012 made my skills look like recreational gymnastics. And same with 2016. So I don’t think we could ever compare, thankfully, because I think I would fail miserably in every Olympics but my own. But yeah, I think it’s just an ever changing sport that continues to push these athletes past another boundary. For example, Simone Biles. I mean she’s — in my opinion, the greatest gymnast we’ve ever seen in the history of our sport. And I think she’s just going to continue pushing past those boundaries. HUGGINS: Do you think that kind of flexibility and capacity for change in a sport is good or detrimental? One of the beautiful things of our sport is because it is subjective, because it is artistic, we as athletes have our own ability to give the audience our interpretation of our sport. If that makes any sense, so I can go back into my own gym and choreograph what I think is the most beautiful Olympic caliber routine and it’d be completely different than the Russians or the Chinese. But in 2012, what was detrimental was the rulebook that was written was so restrictive that you looked at the Russians, the Chinese, the United States team, the Brazilians, everyone. And they looked identical. Because that rule book that they wrote didn’t allow for interpretation or artistry. And I think that’s when our sport is hurt by these changes. HUGGINS: Do you think 2012 was the worst for that then recently or even worse than when you were competing in 2008? JOHNSON: I would say 2012 was the worst for that. I feel it was the most restrictive rule book or code — we call it a code. I think it was the most restrictive code we had ever seen, but I think it did correct itself in 2016, because you got to see Simone Biles, Aly Raisman, Gabby Douglas, Madison Kocian, Jordyn Wieberall come out, looking like completely different athletes. JOHNSON: But succeeding and winning gold medals on all different apparatuses. HUGGINS: So that actually brings me to what I wanted to do next anyway, was talk a little bit about U.S.A. Gymnastics which is, correct me if I’m wrong, that’s the governing body in the U.S. right? They act at least like they would function as the N.F.L. for gymnastics in the U.S.. Can you kind of talk about the role they play in this sport, especially compared to how the N.F.L. functions in the life of your husband? JOHNSON: Yes. So the way our governing bodies work under the U.S. Olympic organization is as follows: There is the U.S. Olympic Committee, which is kind of at the top of the pyramid within the United States. And they are a non-profit government funded organization that governs every sport within the United States. Under them is a governing body for every sport that competes at the Olympics in the United States. For example, U.S.A. Gymnastics. U.S.A. Gymnastics their governing body, their responsibility is to essentially pick the Olympic team, find a place for them to train, to give them some organization, to give them some funding, and a protective board or governing sense that protects the athlete’s rights. And I guess the difference between that and the N.F.L., I guess is no different. HUGGINS: Well there’s — I’m curious about how much they look into, or who is looking into, making a living from it or any of the money side of it. Mostly because it’s still unclear to most people how or if people are able to make a living doing these sports while they’re in their full capacity to do them, like while — and I want to get into this soon, but gymnastics obviously you’re only able to do it professionally for a short amount of time. But for other Olympic sports, you can do it until — I don’t know how old Michael Phelps is but for a little bit longer. And I’m curious as to who’s looking out for the wealth and well-being of Olympic athletes. JOHNSON: Yes. Interesting. So that is what is interesting about the governing bodies of the Olympic sports within the United States. I might be wrong in this, so don’t quote me by law, but I’m pretty sure that every governing body or unique governing body gets to dictate their compensation for those individual athletes in each individual sport. For example, U.S.A. dictates our compensation or our salary as professional United States Gymnastics, performers, Olympic caliber athletes. So when I technically qualified under the U.S.A. Gymnastics committee to the national team or the U.S.A. National team, I signed a contract that states I will be paid $1,500 a month. I will not be allowed to do X Y and Z or compete for other countries. I will give all of my profits to U.S.A. Gymnastics when it comes to winning. I will share 20 percent with my coach I will share 50 percent with the organization and I mean yada yada. I mean, it’s very restrictive. And one of the unfortunate things about gymnastics, I don’t know the details of every sport, is that our compensation was — in a nice way, put nicely, I think very inappropriate for the jobs we were doing. JOHNSON: However I think — You asked earlier, who is looking out for the best interests of the athletes. Well the interesting part of that is the interest of the athletes is also dictated by the same governing body that is paying us which I think shouldn’t be the same organization. When both people are trying to make a profit but also trying to protect themselves, I think that is a conflict of interest. So when we would compete, we would get these prize monies from China, Russia, whatever it may be. And that prize money goes directly into the U.S.A.G. president’s bank account or whatever bank account that might be. And that is then distributed amongst the athletes after their shares are taken. And it’s the president of this governing body that gets to determine what those cuts are. HUGGINS: How fascinating. That’s so interesting it’s like — That’s a little different than the N.F.L. HUGGINS: It’s not obviously the same playing field of income or profits as the N.F.L.. But still I mean that actually kind of brings me to retiring. So obviously, gymnasts are some of the youngest retirees in sports, I think. You retired at 20. But it’s not uncommon for people to retire earlier than that. And I mean some people– I think some people make it to 22 or 24. But you retired at 20 which is before most other athletes have even made it professional in other sports. And for the most part, I don’t think, it doesn’t sound like the average professional gymnast will make enough money while you’re competing to just retire full time after that. So when you were still in full eyes on the prize for Beijing were you thinking or was anyone talking to you about life after gymnastics yet? JOHNSON: Not at all. When I was training for the Olympics and signing over endorsements and getting my monthly paycheck of anywhere from $1,200 to $2,500 from my governing body, as a 16 year old, I’m not thinking about the future. And I didn’t have anyone talking to me about the future. I did have my parents being the responsible parents saying we should think about college, we should think about scholarships. We should think about at least making enough money to pay for college. You know, putting it into my ear. But as far as a governing body or anybody within the Olympic organization protecting us as children in our best interest, in our future, as far as compensation and money went, we didn’t have anyone. It was just perform, do your duties. And then off with you. HUGGINS: And — wait so you didn’t even get money from the endorsements? JOHNSON: So, how the majority of Olympic endorsements work, is you sign an Olympic endorsement, such as a Coca-Cola, a McDonald’s, Nike, Adidas, Under Armour before the Olympics even start. And the way they select these athletes is based on essentially Las Vegas gambling or betting odds. They say, “Shawn Johnson looks like she’s going to win X amount of medals.” But the way these contracts are structured, is these athletes aren’t paid any money upfront. The only way they win money or they earn money is by winning medals. So if you sign a deal with Nike that’s, say a million dollars, whatever it may be. But you go to the Olympics and you don’t win a medal. You don’t earn any money. Which I guess is similar to an N.F.L. contract. You might sign a two million dollar deal, but if you don’t play a season game, you don’t get paid. But there is this gamble of, you don’t make money unless you succeed at the Olympics. And when you’re talking about thousands and thousands of athletes who have reached the pinnacle of their sport by just qualifying to the Olympics. The fact that they aren’t getting compensated for their journey that’s gotten them to that point, and saying to them, you’re only going to get compensated if you win, I think is is pretty extreme. HUGGINS: Yeah. And what you left out there is that you have to dedicate 100 percent of your time to get to the Olympics in the first place. So it’s not like you were working part time making a decent-ish living while you were trying to qualify for the Olympics. And so this whole like amateurs not getting paid thing doesn’t matter that much to you. This is a big deal. Did it matter whether if you did get a medal what the medal was? The fact that you got three silvers instead of four golds, did that like hurt your income in any way? JOHNSON: Oh yes. It hurt my income, I mean favorably. JOHNSON: The difference between a bronze, a silver, and a gold — I mean you’re talking a zero with each placement. If you win a bronze medal you might be getting $50,000 or $5,000. If you win a silver you would go up from there. So $5,000 for a bronze $50,000 for a silver, $500,000 for a gold. JOHNSON: So if you calculate in I technically lost three golds, I’m out over a million dollars. HUGGINS: Wow. I mean did you ask Nastia for some of that cut? JOHNSON: Yeah, I wish. I’ll ask her tomorrow. HUGGINS: Maybe she can buy you a car or something. JOHNSON: Like hey, can I get my paycheck? HUGGINS: So is there a typical life after gymnastics then? I want to get into what you specifically are doing, but for your fellow gymnasts, have you noticed a typical post career? JOHNSON: I would say the typical post career for an Olympic athlete or Olympic gymnast is to go to college and become a collegiate coach or a gymnastics coach of some sort, and just live within the gymnastics world for the rest of your life. I mean, that’s been the most common trend amongst the past probably 12 Olympic Games. HUGGINS: And then you didn’t do that right? I heard that you were going to maybe go to Vanderbilt but then decided not to. I’m just curious about that decision and then then feel free to talk more about the projects you’re working on now and how you got into them. So I can go further into that after you answer. JOHNSON: Yeah my life — Okay, to start, I was one of those children that wanted to plan out my entire life. I wanted every day planned, every year planned. I had a path for myself. And what’s funny is the Olympics were not part of that. I wanted nothing more than to go to Stanford University. I wanted to be an orthopedic surgeon and I wanted to live in Iowa and just be an orthopedic surgeon. That’s what I wanted to be my entire life. And — right? When I qualified to the Olympics, I compete at the Olympics. I was successful but I still had that thought of tomorrow I’m going to fly back to Des Moines, Iowa. I’m going to finish out my senior year. I had already gotten into Stanford University and I was getting ready to go out there. That was my plan and when I won that one gold medal, that kind of pushed me over the edge when it came to the media. I was flooded with these opportunities of entertainment and hosting and TV shows and speeches. And it just seemed to be like month after month, year after year, I was just staying busy and I was making a decent income. I was learning a ton on the road, but I still hadn’t gone to college to become that doctor. And year after year it became more and more difficult to see myself giving up this kind of career I had built to start back over to become the surgeon. So fast forward I met my husband through actually an Olympic cyclist that I met in the 2012 Olympics. And my husband went to Vanderbilt University. So I saw that as an opportunity. Vanderbilt’s an incredible school. I thought about going there as well. So I said let’s give up Stanford, let’s go to Vanderbilt. See what this guy is about, and take on a new career path. I still wanted to be a doctor. I just didn’t know what kind. I ended up getting into Vanderbilt. I went to start my first month at Vanderbilt and I booked Celebrity Apprentice. And again I found myself back into this career that I had built already. So fast forward again, I had transferred then from Vanderbilt to Penn State online. It was an online college program where I could do the entertainment career but also get my collegiate degree. And I kind of found a middle —a happy medium there I guess. Got my degree in business and yeah, gave up that path I had planned for myself. HUGGINS: I wish I had more time to get into the reality TV stuff because I’m a huge fan of a lot of reality TV shows. But I don’t want to keep you too long, and I do have a couple of important questions left. First of all, I want to talk about — I want to make sure we do mention the projects that you’re working on now. I think you have your YouTube channel. And then there’s the CNBC series. JOHNSON: AC2. It’s called Adventure Capitalists. HUGGINS: Is there anything I’m missing, in that? JOHNSON: I actually just launched a new health and fitness brand called F.Y.T. But we’re doing a bunch of online health and nutrition programs for people. HUGGINS: So that makes the answer to this next question fairly obvious at least for that one. But I’m curious how your other projects especially your YouTube and your CNBC series, how those relate to your life as an athlete. In terms of: is it drawing on your competitiveness, your — I don’t know your other things that you’ve developed in your career as an athlete, as a gymnast. JOHNSON: I feel like everything that I have kind of dove into after the Olympics career wise has been kind of random. But I feel the connection, the common connector there, is just it takes me out of my comfort zone and it’s things that I truly enjoy. But they’re just completely random and weird things. I was approached with the CNBC show to be a venture capitalist on essentially Shark Tank, and I knew business I knew how to invest. I knew all the ins and outs but I’d never kind of done that on television. So I didn’t feel like I could do it. And my husband always encouraged me to kind of be uncomfortable — or be comfortable with being uncomfortable and I just started taking on these things that gave me this competitive feeling of, it might not be my Olympic beam routine, but I could make it that, if — as cheesy as that sounds. HUGGINS: That’s not too cheesy. HUGGINS: So finally, I don’t like want to end on a down note. But I mean what gymnastics is in the news for now isn’t the best stuff anymore. And I know you had very very strong words for U.S.A. Gymnastics after the Larry Nassar trial. I want to say you said quote, U.S.A. Gymnastics has failed as a governing body to protect the athletes that it supports and claims to care about. And I think you’ve also said that you still think gymnastics is the best sport in the entire world. I think that’s a direct quote. But if you had kids you wouldn’t let them do gymnastics at least not in its current state. So I’m just curious what would have to happen to get you to reconsider that. Like what would U.S.A. Gymnastics have to do to reclaim their trust? JOHNSON: Wow. That’s a good question. I don’t know. I feel very hypocritical when I talk about this because everything that I went through as an athlete,Larry Nassarwas my doctor. He was my personal doctor from the time I was 12 years old to the time I was 22. I was lucky enough to not be a victim of the sexual assault, but I could also say just having him be in my room and having him be my personal doctor is is part of that survivorship. And going through all of that, I would still go back and do it again. I would do it again a million times. But when that parental kind of instinct starts to kick in and thinking about future children, I couldn’t imagine allowing my daughter to go through that. I mean just the thought of it just makes me ill. And it’s very hypocritical of me. But I think that’s just the protective side that will come out of anyone. I do believe gymnastics is the greatest sport in the world. I think it teaches young girls and boys so many valuable lessons that they can use for the rest of their lives, physically and mentally. And I feel like from my trust to be earned by U.S.A. Gymnastics again, I know some great people within the sport will have to be probably left though and hurt by that. But I think for the sport to trust that industry again they have to start over. They have to have no doubt in anyone’s mind that there is anyone left within the organization that could potentially have mal intent towards these children. And I think that’s the only way. I hate to say that because there are great people involved. But when you’re talking about something so devastating as what’s going on. I think that’s the only option. HUGGINS: Yeah. Makes sense. Well, I have come to the end of our time here. Thank you so much for being so open and honest throughout all of this. HUGGINS: And I wish you a lot of luck with the rest of — it seems like you have your life kind of put together at least for now, and I hope it keeps going how you want to go. JOHNSON: Thank you. I really enjoyed this and I don’t feel like I have my life together. But it’s such a compliment to hear that. That, I think you’d agree, was a fascinating conversation. Thanks so much to Shawn Johnson and Harry Huggins. If you haven’t already, check out Freakonomics Radio episode No. 351, which featured Johnson. If you want to hear more of our interviews from the athletes and experts featured in our “Hidden Side of Sports” series, sign up for Stitcher Premium. This week, you’ll hear former NFL player Domonique Foxworth on the before, during, and after of the athlete’s life; and history professor David Canton on the huge fall in African-American participation in baseball. Just go to StitcherPremium.com/Freakonomics and use promo code FREAKONOMICS for one month free.